Air pollution control devices (APCD) are a series of devices which are used to prevent a variety of different pollutants, both gaseous and solid, from entering the atmosphere mainly out of the industrial stacks. These control devices can be separated into two broad categories namely (i) devices which control the amount of particulate matter escaping into the environment, and (ii) devices which controls the acidic gas emissions into the atmosphere. By and large the air pollutants are generated due to the combustion of fuels in the furnaces. The major combustion-generated pollutants are the oxides of nitrogen (NOx), sulphur dioxide (SO2), carbon monoxide (CO), unburned hydrocarbons, and particulate matter. The generated pollutants are carried by the exhaust gases produced during the combustion of the fuel. These exhaust gases are then normally passed through the APCDs before releasing them to the atmosphere. The pollutants are removed, destroyed, or transformed in the control devices before the discharge of the exhaust gas into the atmospheric air. Common methods for removing the pollutants from the exhaust gases work on the following principles. Destroying pollutants by thermal or catalytic combustion, such as by use of a flare stack, a high temperature incinerator, or a catalytic combustion reactor. This technique is used when the pollutants are in the form of organic gases or vapours. During flame combustion or catalytic process, these organic pollutants are converted into water vapour and relatively less harmful products, such as carbon dioxide (CO2). Changing pollutants to less harmful forms through chemical reactions, such as converting nitrogen oxides (NOx) to nitrogen and water through the addition of ammonia to the exhaust gas in front of a selective catalytic reactor. In the technique known as ‘absorption’, the gaseous effluents are passed through scrubbers or absorbers. These contain a suitable liquid absorbent, which removes or modifies one or more of the pollutants present in the gaseous effluents. In the technique known as ‘adsorption’, the gaseous effluents are passed through porous solid adsorbents kept in suitable containers. The organic and inorganic constituents of the effluent gases are trapped at the interface of the solid adsorbent by physical adsorption. Collecting particulate emissions using air pollution control devices before they reach the atmosphere. The APCDs collect particulate emissions work on the principle of (i) gravity separation, (ii) cyclonic separation, (iii) filtration, (iv) electrostatic precipitation, and (v) wet scrubbing. The most commonly used APCDs are the (i) dust catchers (ii) cyclones or multi cyclones, (iii) fabric filters also known as bag houses, (iv) electrostatic precipitators (wet and dry types), and (v) scrubbers. The first four control devices control the amount of particulate matter escaping into the environment while scrubbers control the acidic gas emissions into the atmosphere. The principle of a dust catcher is shown in Fig 1. The internal construction of the dust catcher is such that there is a sudden change in the direction of the flow of exhaust gas. This causes the large dust particles to separate because of its higher momentum. The separated particles then settle down because of gravitational force. Cyclones are also known as centrifugal collectors. They uses cyclonic separation method for the removal of the particulate matter from the exhaust gases. They remove particulate matters by causing the dirty exhaust gas stream to flow in a spiral path inside a cylindrical chamber (Fig 2). 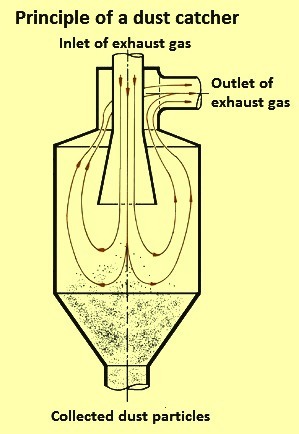 Dirty exhaust gas enters the chamber from a tangential direction at the outer wall of the device forming a vortex as it swirls within the chamber. The centrifugal force created by the circular flow throws the dust particles toward the wall of the cyclone. After striking the wall, these particles fall into a hopper located underneath. The larger particulates because of their greater inertia move outward and are forced against the chamber wall. Slowed by friction with the wall surface, they then slide down the wall into a conical dust hopper at the bottom of the cyclone. The cleaned exhaust gas swirls upward in a narrower spiral through an inner cylinder and emerges from an outlet at the top and accumulated particulate dust is periodically removed from the hopper situated in the bottom for disposal. The most common types of cyclones in use are (i) single cyclone separators, and (ii)) multi cyclone separators. The single cyclone separators create a dual vortex to separate coarse particles from fine dust. The main vortex spirals downward and carries most of the coarser dust particles. The inner vortex created near the bottom of the cyclone, spirals upward and carries finer dust particles. The multiple-cyclone separators consist of a number of small diameter cyclones, operating in parallel and having a common gas inlet and outlet. They operate on the same principle as cyclones by creating a main downward vortex and an ascending inner vortex. They are more efficient than single cyclones because they are longer and smaller in diameter. The longer length provides longer residence time while the smaller diameter creates greater centrifugal force. These two factors result in better separation of dust particulates. The pressure drop of multi cyclone separators is higher than that of single cyclone separators. 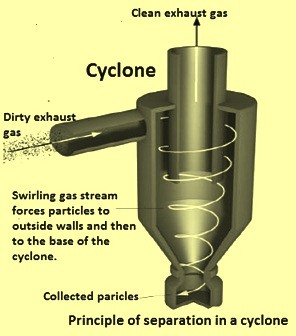 Cyclones are best at removing relatively coarse particulates. They can routinely achieve efficiencies of 90 % for particles larger than about 20 micro meters. However, cyclones are not sufficient to meet stringent air quality standards. They are typically used as pre-cleaning devices and are normally used along with other more efficient cleaning equipment such as fabric filters and electrostatic precipitators. Fabric filter are also known as ‘bag houses’. They use filtration to separate dust particulates from dusty gases. They are one of the most efficient and cost effective types of dust collectors available. Dust-laden gases enter the fabric filter and pass through fabric bags which act as filters. The bags can be of woven or felted cotton, synthetic, or glass-fiber material in either a tube or envelope shape. The high efficiency of these filters is due to the dust cake formed on the surfaces of the bags. The fabric filters primarily provides a surface on which dust particulates collect through the following four mechanisms. Inertial collection – Dust particles strike the fabrics placed perpendicular to the gas flow direction instead of changing direction with the gas stream. Interception – Particles which do not cross the fluid streamlines come in contact with fabrics because of the fiber size. Brownian movement – Sub micro metre particles are diffused, increasing the probability of contact between the particles and collecting surfaces. Electrostatic forces – The presence of an electrostatic charge on the particles and the filter can increase dust capture. 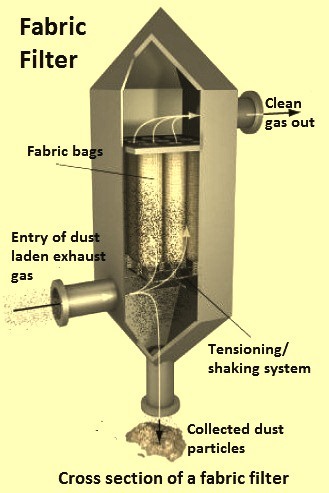 A combination of these mechanisms results in formation of the dust cake on the filter which eventually increases the resistance to gas flow. The filter is required to be cleaned periodically. A typical fabric filter (Fig 3 shows the cross section) consists of an arrangement of long, narrow bags (each with a diameter of around 250 mm). These bags are suspended upside down in a large enclosure. Dust-laden exhaust gas is blown upward through the bottom of the enclosure by fans. Particulates are trapped inside the filter bags while the clean exhaust gas passes through the fabric filter and exits at the top of the bag house. A fabric filter dust collector can remove practically 100 % of particles as small as 1 micro meter and a significant fraction of particles as small as 0.01 micro meters. Fabric filters however, offer relatively high resistance to gas flow and they are expensive to operate and maintain. Also, to prolong the useful life of the filter fabric the exhaust gases to be cleaned need to be cooled (usually below 300 deg C) before they are passed through the bag house. The cooling coils needed for this purpose add to the capital cost. Further, certain filter fabrics (e.g. those made of ceramic or mineral materials) can operate at higher temperatures. Several compartments of filter bags are often used in a single bag house installation. This arrangement allows individual compartments to be cleaned while others remain in service. The filter bags are cleaned by mechanical shakers or by reversing the flow of exhaust gas and the loosened particulates are collected and removed for disposal. Based on the cleaning method, there are three common types of fabric filters. These are (i) mechanical shaker, (ii) reverse air, and (iii) reverse jet. In mechanical-shaker type of fabric filters, tubular filter bags are fastened onto a cell plate at the bottom of the filter and suspended from horizontal beams at the top. Dirty gas enters the bottom of the filter and passes through the filter, and the dust collects on the inside surface of the bags. Cleaning is accomplished by shaking the top horizontal bar from which the bags are suspended. Vibration produced by a motor-driven shaft and cam creates waves in the bags to shake off the dust cake. These filters can operate intermittently or continuously. Intermittent units can be used when processes operate on a batch basis. When a batch is completed, the filter can be cleaned. Continuous processes use compartmentalized filters. When one compartment is being cleaned, the exhaust gas flow can be diverted to other compartments. In these filters, there must be no positive pressure inside the bags during the shake cycle. Pressures (as low as 0.5 mm water gauge) can interfere with the cleaning process of the bags. The air to cloth ratio for these filters is relatively low. Hence, the space requirements are quite high. In reverse air fabric filters, the bags are fastened onto a cell plate at the bottom of the filter and suspended from an adjustable hanger frame at the top. Dirty gas normally enters the filter and passes through the bag from the inside, and the dust collects on the inside of the bags. These filters are compartmentalized to allow continuous operation. Before a cleaning cycle begins, filtration is stopped in the compartment to be cleaned. Bags are cleaned by injecting clean air into the dust collector in a reverse direction, which pressurizes the compartment. The pressure makes the bags collapse partially, causing the dust cake to crack and fall into the hopper below. At the end of the cleaning cycle, reverse airflow is discontinued and the compartment is returned to the main stream. The flow of the dirty gas helps maintain the shape of the bag. However, to prevent total collapse and fabric chafing during the cleaning cycle, rigid rings are sewn into the bags at intervals. Space requirements for a reverse air fabric filter are comparable to those of a mechanical shaker filter. The maintenance needs are somewhat greater. In reverse pulse jet fabric filter, individual bags are supported by a metal cage, which is fastened onto a cell plate at the top of the filter. Dirty gas enters from the bottom of the filter and flows from outside to inside the bags. The metal cage prevents collapse of the bag. Bags are cleaned by a short burst of compressed air injected through a common manifold over a row of bags. The compressed air is accelerated by a venturi nozzle mounted at the reverse jet filter top of the bag. Since the duration of the compressed-air burst is short (0.1second), it acts as a rapidly moving air bubble, traveling through the entire length of the bag and causing the bag surfaces to flex. This flexing of the bags breaks the dust cake, and the dislodged dust falls into a storage hopper below. Reverse pulse jet fabric filters can be operated continuously and cleaned without interruption of flow because the burst of compressed air is very small compared with the total volume of dusty air through the collector. Because of this continuous cleaning feature, these filters are normally not compartmentalized. The short cleaning cycle of these filters reduces recirculation and redeposit of the dust. These filters provide more complete cleaning and reconditioning of bags than shaker or reverse air cleaning methods. Also, the continuous-cleaning feature allows them to operate at higher air-to-cloth ratios, so the space requirements are lower. This cleaning system works with the help of digital sequential timer attached to the fabric filter. This timer indicates the solenoid valve to inject the air to the blow pipe. Fabric filters generally have the parts namely (i) clean plenum, (ii) dusty plenum, (iii) bag, cage, venturi assembly, (iv) tube plate, (v) Rotary airlock valve/Screw, (vi) compressed air header, (vii) blow pipe, and (viii) housing, and (ix) hopper. 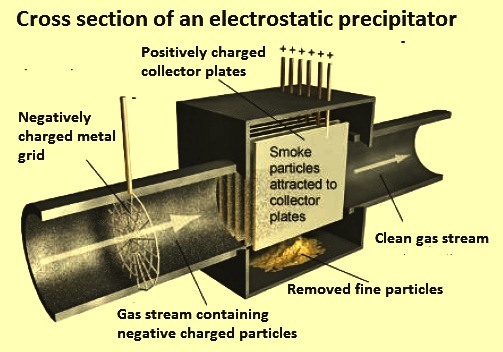 An electrostatic precipitator (ESP) is a particulate collection device which removes particles from a flowing gas (such as exhaust gas) using the force of an induced electrostatic charge. ESPs are highly efficient filtration devices which minimally impede the flow of gases through the device, and can easily remove fine particulate matter from the exhaust gas stream. ESP applies energy only to the particulate matter being collected and therefore is very efficient in its consumption of energy (in the form of electricity). The ESP consists of (i) baffles for the distribution of the flow of exhaust gas, (ii) discharge and collection electrodes, (iii) a dust clean-out system, and (iv) collection hoppers. A high DC voltage is applied to the discharge electrodes to charge the particles, which then are attracted to oppositely charged collection electrodes on which they get trapped. The most basic precipitator contains a row of thin vertical wires, and followed by a stack of large flat metal plates oriented vertically, with the plates typically spaced around 10 mm to 180 mm apart, depending on the application. The exhaust gas stream flows horizontally through the spaces between the wires, and then passes through the stack of plates. A negative voltage of several thousand volts is applied between wire and plate. If the applied voltage is high enough an electric (corona) discharge ionizes the gas around the electrodes. Negative ions flow to the plates and charge the gas-flow particles. The ionized particles, following the negative electric field created by the power supply, move to the grounded plates. Particles build up on the collection plates and form a layer. The layer does not collapse because of the electrostatic pressure (given from layer resistivity, electric field, and current flowing in the collected layer). The performance of ESP is very sensitive due to two particulate properties namely (i) resistivity and (ii) particle size distribution. The cross section of an ESP is shown in Fig 4. In a typical ESP, the collection electrodes comprise a group of large rectangular metal plates suspended vertically and parallel to each other inside a boxlike structure. There are usually hundreds of plates having a combined surface area of around 10,000 sq m. Rows of discharge electrode wires hang between the collection plates. The wires are given a negative electric charge whereas the plates are grounded and thus become positively charged. Particles which stick to the collection plates are removed periodically when the plates are shaken, or ‘rapped’. Rapping is a mechanical technique for separating the trapped particles from the plates which typically become covered with a 6 mm layer of dust. Rappers are either of the impulse (single-blow) or vibrating type. The dislodged particles are collected in a hopper at the bottom of the ESP and removed for disposal. An ESP can remove particulates as small as 1 micro meter with an efficiency exceeding 99 %. The ESPs are very effective in removing fly ash from the combustion gases of coal fired furnaces. A wet electrostatic precipitator (wet ESP) operates with saturated exhaust gas streams (100 % relative humidity). Wet ESPs are generally used to remove liquid droplets such as sulphuric acid mist from the process gas streams. The wet ESP is also used normally where the gases are (i) high in moisture content, (ii) contain combustible particulate, and (iii) have particles which are sticky in nature. The preferred and most modern type of wet ESP is a down flow tubular design. This design allows the collected moisture and particulate to form slurry that helps to keep the collection surfaces clean. Plate style and up flow design wet ESPs are very unreliable and are not to be used in applications where particulate is sticky in nature. The exhaust gases of combustion may contain substances considered harmful to the environment, and the scrubber can remove or neutralize these substances. Scrubber systems are a diverse group of APCDs which can be used to remove some particulates and/or gases from exhaust gas streams. Traditionally, the term ‘scrubber’ is being referred to pollution control devices which use liquid to wash unwanted pollutants from a gas stream. Recently, the term is also used to describe systems which inject a dry reagent or slurry into a dirty exhaust stream to ‘wash out’ acid pollutants. Scrubbers are one of the primary devices which control gaseous emissions, especially acid gases. Scrubbers can be either wet scrubber or dry scrubber. The term wet scrubber describes a variety of devices which remove pollutants from the exhaust gas streams. 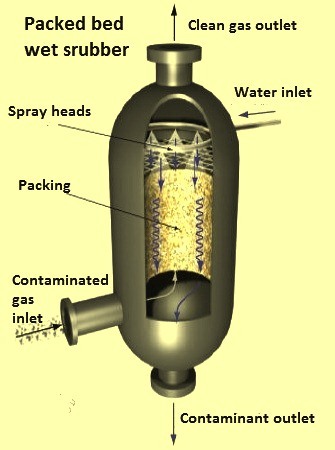 In a wet scrubber, the contaminated gas stream is brought into contact with the scrubbing liquid usually (i) by spraying it with the liquid, (ii) by forcing it through a pool of liquid, or (iii) by some other contact method, so as to remove the pollutants. The design of wet scrubbers depends on the process conditions and the nature of the pollutants involved. Inlet gas characteristics and dust properties (if particles are present) are of primary importance. Scrubbers can be designed to collect particulate matter and/or gaseous pollutants. Wet scrubbers remove dust particles by capturing them in liquid droplets. Wet scrubbers remove pollutant gases by dissolving or absorbing them into the liquid. Any droplets which are in the scrubber inlet gas must be separated from the outlet gas stream by means of another device referred to as a mist eliminator or entrainment separator (these terms are interchangeable). Also, the resultant scrubbing liquid must be treated prior to any ultimate discharge or being reused. There are numerous configurations of scrubbers and scrubbing systems, all designed to provide good contact between the liquid and polluted gas stream. Fig 5 shows a packed bed wet scrubber. The wet scrubber is used to clean air, exhaust gas or other gases of various pollutants and dust particles. Wet scrubber works via the contact of the particulate matter with the scrubbing solution. Solutions can simply be water (for dust) or solutions of reagents that specifically target certain compounds. Removal efficiency of pollutants is improved by increasing residence time in the scrubber or by the increase of surface area of the scrubber solution by the use of a spray nozzle, packed towers or an aspirator. Wet scrubbers may increase the proportion of water in the gas, resulting in a visible stack plume, if the gas is sent to a stack. A dry or semi-dry scrubbing system, unlike the wet scrubber, does not saturate the exhaust gas stream which is being treated with moisture. In some cases no moisture is added, while in some other case only that amount of moisture is added which can be evaporated in the exhaust gas without its condensation. Hence, dry scrubbers normally do not have a stack steam plume or wastewater handling/disposal requirements. Dry scrubbing systems are used to remove acidic vapours (such as SO2 and HCl) which primarily come from combustion sources. There are a number of dry types scrubbing system designs. However, all consist of two main sections or devices namely (i) a device to introduce the acid gas sorbent material into the gas stream, and (ii) a particulate matter control device to remove reaction products, excess sorbent material as well as any particulate matter already in the exhaust gas. Dry scrubbing systems can be categorized as dry sorbent injectors or as spray dryer absorbers. Spray dryer absorbers are also called semi-dry scrubbers or spray dryers. Dry scrubbing systems are often used for the removal of odorous and corrosive gases from wastewater treatment plant operations. The media used is typically an activated alumina compound impregnated with materials to handle specific gases such as hydrogen sulphide. Media used can be mixed together to offer a wide range of removal for other odorous compounds such as methyl mercaptans, aldehydes, volatile organic compounds, dimethyl sulphide, and dimethyl disulphide. Dry sorbent injection involves the addition of an alkaline material (usually hydrated lime or soda ash) into the gas stream to react with the acid gases. The sorbent can be injected directly into several different locations such as the combustion process, the exhaust gas duct (ahead of the particulate control device), or an open reaction chamber (if one exists). The acid gases react with the alkaline sorbets to form solid salts which are removed in the particulate control device. These simple systems can achieve only limited acid gas (SO2 and HCl) removal efficiencies. Higher collection efficiencies can be achieved by increasing the exhaust gas humidity (i.e., cooling using water spray). In spray dryer absorbers, the flue gases are introduced into an absorbing tower (dryer) where the gases are contacted with finely atomized alkaline slurry. Acid gases are absorbed by the slurry mixture and react to form solid salts which are removed by the particulate control device. The heat of the exhaust gas is used to evaporate all the water droplets, leaving a non-saturated exhaust gas to exit the absorber tower. Spray dryers are capable of achieving high (more than 80 %) acid gas removal efficiencies.